Are you looking for an unbelievable deal on new production 308 Winchester rounds? 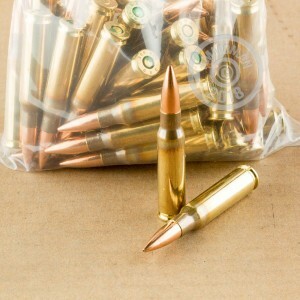 AmmoMan.com is offering our "Mixed" 308 Win rounds in loose packed 50 round bags to get you out to the range for less. These new brass or nickel plated cartridges are offered due to cosmetic damage that was present on the manufacturer's packaging. You can expect to see a variety of different manufacturers in this lot as well as different bullet types and grain weights. In this bag of 50 it is common for there to be some FMJ rounds but you may also see soft points, HPBTs, polymer tips and others. 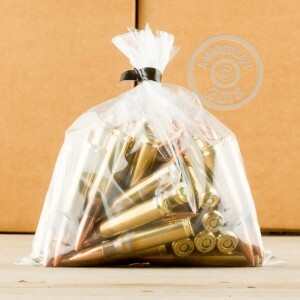 All of the casings will either be brass or nickel plated brass, there will not be any steel cased ammo in these bags. Don't forget, at AmmoMan.com all orders over $99 will ship for free so stock up and save! Note: These mixed bags my include Berdan primed brass, which is non-reloadable and non-corrosive. Ordered 7 bags all were surplus hirtenberger 146 grain FMJ..
Best 308 WIN Deal Ever!!! So I took a leap of faith and bought the Ammo, oh man, I wasn't disappointed at all. The cost was cheap per round, however, I swear the quality I received were worth way more than that. I'm definitely looking forward to this deal again. I ordered 4 bags of this mixed brass. I got a pretty good mix of rounds. 20 Federal FMJs, 50 Magtech 168 grain HP-BT, and a mix of various other FMJs. No hunting or SD rounds, but that's not a big deal. Will be buying more if I get a chance.